ʿĀʾisha, the daughter of Abu Bakr (Arabic: عائشة بنت ابي بکر) (d. 58/678) was the third wife of the Prophet Muhammad (s), who married him after the death of Lady Khadija (a) and after his marriage to Suda. There is a disagreement among historians as to her age at time of her marriage with the Prophet (s). The Incident of Ifk was a prominent event in A'isha's life. When after an incident, she was accused by some people, some verses of Qur'an 24 were revealed, in which God reprehended the accusers. Of the wives of the Prophet (s), she has gained more fame due to her political activities and positions and the role she played after the demise of the Prophet (s). She tried her best to pave the path for the caliphate of the first and the second caliphs, and she helped them strengthen their positions by citing hadiths about their virtues. During Uthman's caliphate, she supported him at first, but later she turned away from him and orchestrated a riot against him which led to his murder. After the murder of Uthman, A'isha rioted against Ali (a) with the intention of avenging for Uthman. With the help of some companions, she started the Battle of Jamal against Ali (a). Sunni scholars appeal to certain hadiths to show the virtues of A'isha and her being favored by the Prophet (s). However, the Shi'a reject such evidence, pointing to her contemptuous behaviors and jealousy. The Shi'a have levelled many criticisms againt her behavior and conduct because of perturbing the Prophet (s), her stances during the caliphate of Imam Ali (a), and her role in initiating the Battle of Jamal. A'isha was the daughter of Abu Bakr who was from the family of Taym, and her mother Um Ruman was the daughter of Amir b. Uwaymir from the tribe of Banu Kinana. A'isha's teknonym was Umm 'Abd Allah after her nephew, 'Abd Allah b. al-Zubayr. In many historical sources, she is known with the title, "Umm al-Mu'minin" (Mother of Believers). It is said that the Prophet (s) referred to, and addressed, her as al-Humayra'. There is a well-known hadith in which the Prophet (s) told her: "talk to me, O Humayra'". The hadith was first cited by al-Ghazali in his Ihya' 'ulum al-din, but it is not cited in any earlier sources. Al-Fattani, a Sunni scholar (d. 986/1578) writes: what is cited by al-Ghazali has no origins. Sayyid Murtada 'Askari, a Shiite scholar, also believes that the hadith is totally groundless, taking it to be fabricated, and wrongly attributed to the Prophet (s), by al-Ghazali. Aisha was one of the wives of the Prophet (s). She married him after the death of Lady Khadija (a) and after the Prophet's marriage to Suda, the daughter of Zam'a b. Qays. Her marriage with the Prophet (s) lasted nine years and five months. It is widely agreed that the marriage took place after the demise of Lady Khadija (a). However, there is a disagreement as to whether it occurred two or three years before Hijra. On some accounts A'isha's marriage to the Prophet (s) preceded his marriage to Suda. However, according to the majority of hadiths, the Prophet's marriage to Suda preceded his marriage to A'isha. It is said that Khawla, Uthman b. Maz'un's wife, went to Abu Bakr and proposed the marriage to A'isha's father. The Prophet (s) married A'isha in Shawwal of 11 (December 632). The mahr for their marriage was four hundred dirhams. There are disagreement about her age at the time of marriage. Her age at the time of marriage and consummation is reported between six to eighteen. According to popular sources of history, A'isha was around six or seven years old at the time of her marriage to the Prophet (s). The consummation of their marriage took place a few years later after the migration to Medina when A'isha was nine years old. Al-Sayyid Ja'far Murtada al-'Amili denies that A'isha was underage at the time of marriage. He argues that she was between thirteen and seventeen at the time of 'aqd (the Marriage formula). He cites Ibn Ishaq's account according to which A'isha was one of the people who converted to Islam early after Bi'tha; in fact she was the nineteenth Muslim. Al-Sayyid Ja'far Murtada al-'Amili draws on this to show that if she was, say, seven at the time of Bi'tha, then she must have been seventeen at the time of marriage and twenty at the time of Hijra, unless it is claimed that she was younger than seven when she converted to Islam. According to narrations that appear under the exegesis of certain verses of Qur'an 24, it is related that in the year 5/626-627, on the return from the Battle of Banu l-Mustaliq when the caravan had halted for rest, A'isha distanced herself from the caravan to relieve herself. When she found her necklace to be missing, she went looking for it. The caravan, not aware that she was missing, left carrying her palanquin with them assuming she was inside it. Upon returning to the place the caravan was pitched and finding it vacant, she stayed there until a man named Safwan b. Mu'attal came to her and gave her his camel and escorted her to her caravan. This incident caused some companions of the Prophet (s), who according to Islamic texts were hypocrites, to defame A'isha. They accused A'isha of unchaste behavior and consequently, the aforementioned verses of the Qur'an announced slander of chaste women to be a grave sin. Sunnis believe that the revelation of these verses exhibits a virtue for A'isha. Thus, they quoted A'isha herself and her close companions as saying that she was superior to other wives of the Prophet (s); for example, the quote that the most favored woman for the Messenger of God was A'isha. However, some Shiite scholars, while admitting that the verses were revealed about A'isha, deny that they constitute a virtue for her, because they only acquit A'isha of adultery. However, some of these verses are said to be about Mariya al-Qibtiyya, another wife of the Prophet (s). During the period of the caliphate of Abu Bakr and Umar, A'isha did not directly interfere in political matters in spite of being the wife of the Prophet (s), the daughter of the first caliph, occupying a high social status and being well served by the first two caliphs. According to a group of Shi'a authors, A'isha played an important role in making Abu Bakr accede to caliphate, and on the last days of the Prophet's (s) life, strove to pave the ground for her father's caliphate. Likewise, she narrated traditions from the Prophet (s) mentioning the virtues of Abu Bakr and Umar in order to help establish and legitimize their caliphate. There are accounts which relate the first two caliphs offering gifts and reaching out to A'isha and extending continuous help and offerings to her much more compared to the other wives of the Prophet (s). These reports have caught the attention of the Shi'a and have been regarded as a form of unfairness. A'isha's relation with Uthman was cordial during the first few years of his caliphate, but soured during the end. However, in the second half of his caliphate, their relationships tended to hostility, cultivating in her leadership of riots against, and murdering, Uthman. Based on accounts of the dispute between A'isha and the third caliph, it was grounded in Uthman's poor administrative performance, tribalism, and corruption. Moreover, political disputes between A'isha and Uthman was fueled by his injustice to companions such as 'Abd Allah b. Mas'ud, 'Ammar, Abu Dhar, and Jundab. In her sermons, as well as in her encounters with Uthman in the Mosque of Medina, she seriously criticized the caliph. In response, Uthman likened her to the wives of Noah (a) and Lot (a) who betrayed their husbands and entered the Hell. A'isha strongly reacted to the response and shouted, "kill the stupid old man, because he has become an unbeliever", thus announcing that Uthman deserved death. A'isha was amongst the opponents of Imam Ali (a). Some writers have recognized this conflict to have begun during the lifetime of the Prophet (s) itself. The role A'isha played in stimulating a massive uprising against the caliphate of Imam Ali (a), which led to the Battle of the Camel, was a huge indicator of her enmity towards him. Some Sunni writers believed her to be under the influence of instigative evil-doers and supposed her gathering of an army to be for the revenge from Uthman's killers and not an act of opposition to Imam Ali (a). They considered this an error in ijtihad for which A'isha herself was later repentant. A'isha, who was amongst the opponents of Uthman and was present in Mecca at the time of Uthman's murder, on hearing the news of Imam Ali's caliphate, remained in Mecca. After a while when Talha and Zubayr reached Mecca, the three after gathering an army of Arab tribes journeyed to Basra and claimed to avenge the blood of Uthman. After conquering this city, they deployed their army against that of Imam Ali's (a). The battle that ensued thereafter was named the Battle of the Camel because of Aisha's presence in it as she sat on the top of a Camel. This was the first battle to take place between the Muslims themselves. According to al-Shaykh al-Mufid, because of her position as the wife of the Prophet (s) and the daughter of the first caliph, A'isha was able to boost the chances of Imam Ali's opponents to rage a war against him. When the Battle ended, Imam Ali reprehended A'isha whose face was slightly injured. He then ordered Muhammad b. Abi Bakr to check his sister's condition, and she was then respectfully returned to Medina. Although some people believe that A'isha was silent in the Umayyad period, others have shown that she was a supporter of the Umayyad dynasty. Although her brother, Muhammad b. Abi Bakr, was tragically murdered at the command of Mu'awiya and she reprimanded Mu'awiya for murdering Hujr b. 'Adi and his companions, she made a compromise with him after the martyrdom of Imam Ali (a). Mu'awiya also tried to become closer to A'isha by sending her gifts. It is said that he sent her one hundred thousand dinars and paid off eighteen thousand dinars of her debts. Amongst the issues that sustained the Shi'a's criticism of A'isha was her not allowing the burial of Imam al-Hasan's (a) body next to the grave of the Prophet (s). The resting place of the Prophet (s) was in A'isha's house and after that, had been the burial place of the first two caliphs too. With the martyrdom of Imam al-Hasan (a), his brother Imam al-Husayn (a) initially intended to bury him next to the grave of the Prophet (s) in accordance with his will; but A'isha, with the help of the governor of Medina, prevented its fulfillment. To avoid discord, Imam al-Husayn (a) resigned from it. 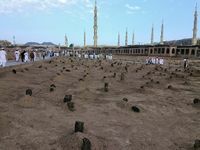 A'isha died of a natural death on 10 Shawwal 58/8 August 678 (or 57/677) at the age of 66 in Medina. Abu Hurayra led her funeral prayer and she was buried in the al-Baqi' cemetery. Some said she died on 17 Ramadan 58. There is a disagreement about why A'isha died. Some people believe that she died a natural death. Others appeal to certain sources to show that Mu'awiya had a role in killing A'isha by digging a hole and throwing her in it because she had criticized him for forcing people to pledge their allegiance to Yazid. People who believe that A'isha was killed, date the event to the late Dhu l-Hijja. Sunni sources of hadiths and history provide detailed and exclusive accounts of A'isha and her virtues. They characterize her as a person of knowledge and literature, as she was educated by her father, and as someone who was familiar with medicine. She is also said to be knowledgeable of revealed verses of the Qur'an, divine rulings, Islamic traditions, poems, Arabian battles, judgeship, and genealogy. It is quoted that A'isha was the only wife of the Prophet (s) who had not been married earlier. Sunni Muslims cite many accounts indicating the Prophet's (s) great affection for her to the extent of calling her the Prophet's (s) most beloved wife. Shi'a scholars consider the reports present in Sunni works about A'isha to be fabricated and exaggerated. They cite reports which mention her actions to have caused the Prophet (s) to become angry and unhappy, or quote the Prophet (s) to have complained on her account. Likewise, they cite reports mentioning A'isha's jealousy towards the Prophet's other wives and her vicious actions against them. Some of these reports even appear in Sunni authentic sources. According to the Shi'a, A'isha's jealous acts against other wives of the Prophet (s) were repugnant. This is shown by historical accounts of her jealousy towards other wives of the Prophet (s), particularly Lady Khadija (a). There is an abundance of evidence for this characteristic in Sunni sources. She is quoted as saying that she felt jealous when the Prophet (s) repeatedly mentioned Khadija (a). There are also accounts of her jealousy of Mariya al-Qibtiyya when she gave birth to a child. According to sources, the Prophet (s) was upset by her jealous acts. On the claims that A'isha was extremely beautiful and favored by the Prophet (s), the Shi'a believe that since most of these accounts go back to A'isha herself and her nephew, 'Urwa b. Zubayr, they are not reliable. They provide several pieces of evidence to show that, to the contrary, she was not beautiful and not favored by the Prophet (s). When Yasir al-Habib, the Kuwaiti Shiite clergyman based in London, cursed A'isha, a number of Shiite scholars in al-Ahasa in Arabia inquired Ayatollah Khamenei's view about insulting and cursing the Prophet's wife. In response, Ayatollah Khamenei wrote, "It is forbidden to insult the symbols of our Sunni brothers, including the denunciation of the Prophet's wife [A'isha]. This includes the wives of all prophets (a) and in particular the head of prophets, our great prophet Muhammad (s)". This fatwa attracted the attention of world and Islamic media. A'isha was amongst the most important narrators of the words and the life of the Prophet (s). The number of traditions related to her exceeds 2100. Parts of the reports narrated by her which are present in hadith sources have been subject to research and criticism by the Shi'a researchers and academics. Ahadith umm al-mu'minin A'isha, written by Sayyid Murtada 'Askari. A'isha dar dawran Ali (a), written by Sayyid Murtada 'Askari. Naqsh A'isha dar tarikh-i Islam, written by Sayyid Murtada 'Askari. A'isha dar sihah-i sitta, written by Husayn Tayyibiyan. A'isha dar hayat-i Muhammad, written by Sibihruz Mawludi. ↑ Ibn Saʿd, al-Ṭabaqāt al-kubrā, vol. 8, p. 46; Balādhurī, Ansāb al-ashrāf, vol. 1, p. 409. ↑ Ibn Saʿd, al-Ṭabaqāt al-kubrā, vol. 8, p. 47-48. ↑ Ibn Hishām, al-Sīra al-nabawīyya, vol. 2, p. 297-302; Bukhārī, Ṣaḥīḥ al-Bukhārī, vol. 5, p. 223-227. ↑ ʿĀmilī, al-Ṣaḥīḥ min sīrat al-nabīyy, vol. 12, p. 320-326. ↑ Wāridī, Naqsh-i hamsarān-i rasūl-i khudā, p. 114. ↑ Ibn Saʿd, al-Ṭabaqāt al-kubrā, vol. 8, p. 53. ↑ Taqīzāda Dāwarī, Taṣwīr-i khāniwāda-yi Payāmbar, p. 115-116. The material for this article is mainly taken from عایشه in Farsi WikiShia. This page was last edited on 10 November 2018, at 05:33. This page has been accessed 44,140 times.